I have been wanting to get started on a Triple Zip Pouch, but I was feeling a little confused about which fabrics I wanted to use. Then last week I stopped into Sew Modern and realized that this was the perfect excuse to buy some of this Olive and Ostrich fabric. I lined it with this purple Lizzy House print. Can you tell purple is my favorite color? I thought the instructions were easy to follow and the pouch came together in a little over an hour. My only problem was the end of the zipper there on the top right where it is kind of smushed down, but that was my own fault. This is a very useful pouch for me since I carry several different creams and medications to deal with my daughter's eczema and food allergies. It looks great! 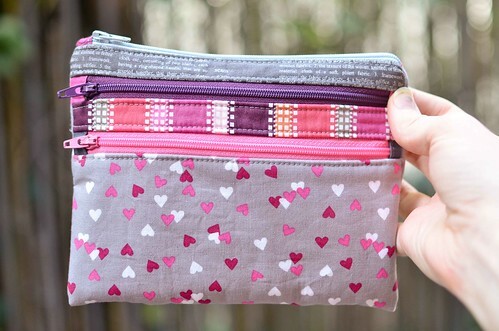 Did you see my blog post today about the pouch I made? I talk about the corners issue. A little over an hour? Lord it must have taken me that long to cut the fabrics. Oh this is really cute! Darling fabrics! love it - especially the strip in the middle. Genius! It's very cute - a great triple zippie! Daughters can be so funny! 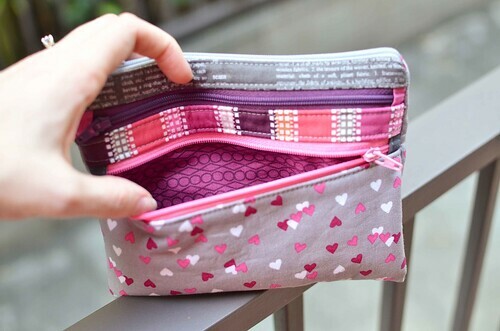 It sure is a cute little pouch! That's the ultimate compliment, isn't it ? It is really pretty and cute! So cute, I absolutely love the fabrics you used! I love the combination of fabrics you chose! I think this is one of my most favorite triple zips yet. Great fabric choices. And my daughter suffered from eczema terribly until this past summer (she's 8 1/2). I hate it for you. It finally started to go away on its own. I thought the day would never come.